'Like' the Arcadia Facebook page and follow us to get a glimpse into community life at Arcadia. Satterley is holding a free movie night for the community! Join the neighbourhood for some frightfully fun trick or treating at this FREE community event thanks to Arcadia and Satterley. Enjoy a free candy buffet, giant haunted slide, fortune tellers, sausage sizzle, spooky entertainment for the kids (and the big kids at heart) plus lots more! Come in costume, BYO your picnic blankets and broomsticks. Our latest edition of CONNECT includes an interview with Lorraine from the Arcadia sales office, a recap of some fun events we've had plus tips on spending a day in beautiful Officer! It's perfect weather to grab a coffee, rug up on the couch and read Arcadia's latest community newsletter - enjoy! From pottery painting and award-winning wine, to adventure activities indoor and out, there’s something for everyone in Officer and the nearby area. make during a day out in this exciting area of Melbourne’s south east. We are excited to celebrate the beautiful mums within our community as well as the opening of our newest park at Arcadia, with a Mother's Day Picnic in the Park! Keep updated and let us know you're coming through the Arcadia community Facebook page! Adopt-a-Dog Day at Arcadia (Sunday 4 March) has featured in the Gazette. Pets Haven spokesperson, Jodie Butler, talks about why adoption should be a person’s first point of call when it comes to pets. See event details and read the full article by clicking here. Satterley is holding a dog day for the Arcadia community and it's not just about adopting a pooch. Pet's Haven Animal Shelter will be there with many ways in which you can help out some homeless pups. We'll also have a local vet to provide FREE consults, as well as dog grooming and walking services. Satterley is holding the first Moonlight Cinema for the community at Arcadia. Screening a family favourite, "The Boss Baby" - who doesn't want to see a secret agent baby at war for adult's love. Or just come along for the FREE POPCORN & COFFEE! We sat down with our friends Tasia and Gracia from MKR to talk all things spring cooking. Check out their favourite ingredients to cook with in spring (hint: it's spicy!) and their tasty recipe for Sambal Terasi. Stay tuned for new Garden Guides released throughout the year for some seasonal cooking inspo! FREE Boot Camp for Arcadia community! Arcadia and Satterley Property Group are excited to provide the community our FREE Summer Series throughout November 2017 to February 2017. We encourage everyone to come along and get active with your community and neighbours through OUR weekly boot camp sessions! The launch of our new display village proved a huge hit with around 700 people attending the opening on Saturday 21st October. Flamingos, unicorns, a polar bear, gorilla and an elephant, were some of the animals that lined the streets of Arcadia as families enjoyed free food and African drum beats in the jungle tent. A range of great prizes were up for grabs with Club Officer donating Spring Carnival tickets for Pakenham Race Course, and Renae Appleby of Narre Warren South won a $,6000 Gold Class cinema experience courtesy of Satterley. The brand new 35-home display village is located at 10 Accord Avenue, Office. Open 7 days. 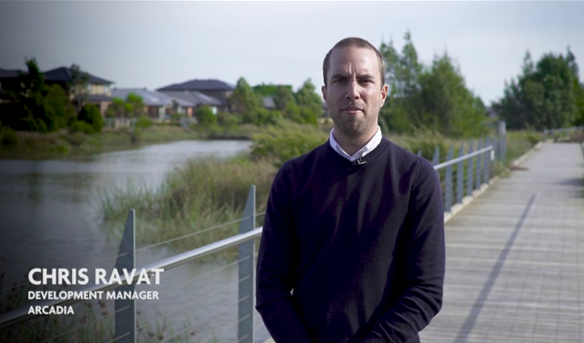 We sat down with some of Victoria's leading builders to chat about their newest display homes at Arcadia, featuring the latest design trends and home inspiration. Our new 35-home display village is now open, so come down and explore these homes for yourself. Located at 10 Accord Avenue, Officer. Open 7 days. In April 2017, 10 Year Nine students from Officer Secondary College travelled to China as part of the 2017 Victorian Young Leaders to China Program. This was a 6-week immersion program designed to prepare them to live and work as citizens and future leaders in an inter-connected global community. This is their story. Satterley Property Group was incredibly proud to assist in sending these young leaders on the trip of a lifetime in partnership with Officer Secondary College. Our latest edition of CONNECT is out now and there is plenty happening around the Arcadia community. Construction has commenced in the stage 4 park, the Display Village is taking shape and we have found ten things you may not know about Officer. Sorting property fads from enduring fashion! Recently Satterley spoke with two of Boutique Homes design experts to find out more about their approach to interior design and styling, and how they judge whether something is a design fad or a long-term trend. Unlike some other suburbs in the south-east, Officer isn't necessarily as well know as say Berwick or Pakenham. To help you get better acquainted with this hidden gem, we’ve compiled our own list of ‘things’ you may not know about Officer.